Evidence has emerged of multiple mass graves containing the bodies of dozens of people killed by Burundian security forces in December, Amnesty International reports. 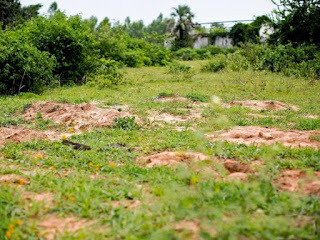 The charity released satellite images, video footage and witness accounts of five possible mass graves in the Buringa area on the outskirts of the capital Bujumbura - which has been targeted by security forces in recent months as it is seen as an opposition stronghold. Witnesses told Amnesty how police and local officials surrounded several neighbourhoods in the capital to retrieve the bodies of those who were killed late last year and took them to undisclosed locations. The charity said: “The imagery, dating from late December and early January, shows disturbed earth consistent with witness accounts. In co-ordinated attacks on 11 December, gunmen stormed three military installations. The next day 28 people were found shot dead in three Bujumbura neighbourhoods. One witness said some of the dead had their hands tied behind their backs. Another said the security forces found their victims using a door-to-door search. Burundi’s government dismissed the report saying it was based on false information supplied by their opponents. It comes as Burundian police arrested 17 people - including a British and French journalist who were later released - in a security sweep. The French government said it had suspended its security and defence activities activities in Burundi over the arrest of Le Monde journalists Jean Philippe Remy and Phil Moore. The incident is the latest in the political crisis which began in April last year when President Pierre Nkurunziza declared he would serve a third term in office - which opposition groups said was unconstitutional. He was elected in a contested vote in July which was boycotted by opposition groups. The UN has said at least 439 people have died in the conflict andnearly quarter of million have fled the East African country as it teeters on the verge of civil war.